Let's get one thing straight, any time I can get away without wearing pants, I'm in! The tunic is like wearing a fitted mumu all day! Nothing squeezing you or binding you. Just freedom, all day! Most times you see tunics paired with great tights and boots or booties. Which is a perfect way to wear the tunic. But I encourage you to give the sporty spin on your tunic a try! 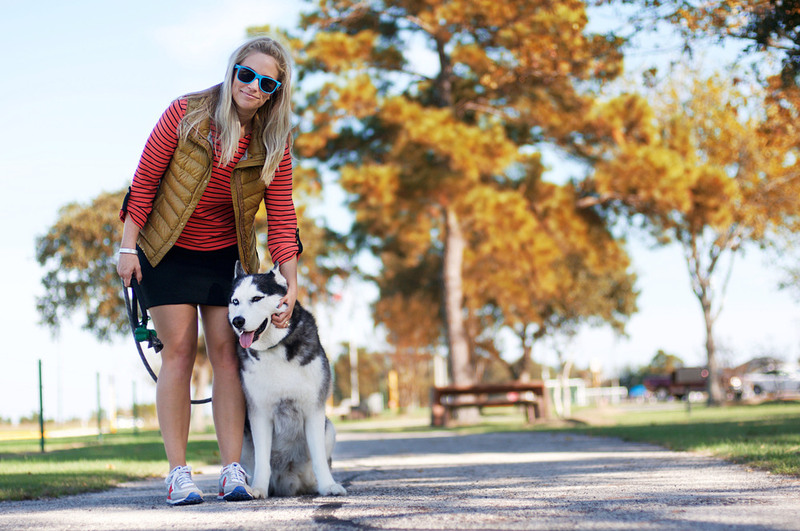 Scratch the leggings or tights, throw on some tennies and a vest for warmth and boom, you're cute and sporty. You'll be walking around like, "yeah - I'm wearing a a tunic that I'm turning into a dress to wear with tennis shoes. And I look awesome"! Long-legged friends be warned. This look works for me because I do not have long model legs. If you were fortunate enough to be born with model legs, test this out first before wearing in public. No one wants to walk around worried that their "bits" could be exposed just from bending over. And while we're being cute and sporty, the "Kimmy Gibbler" hair we talked about yesterday works perfect here!! So get out there and get crap done! Tomorrow is Friday, and next week is Thanksgiving! This would be the perfect outfit to run errands in! Or take a walk in the park with your fur baby :)! Much love! See you all next week! xoxo! As always, please help your self to $25 off your first tote with Le Tote by clicking here!